Home » The Team » John L Knott Jr. While many people are struck by the atypical approach John L. Knott Jr. brings to his urban renewal projects, his approach is actually a return to the values of his family’s business with over 100 years in the historic preservation and urban development. This commitment to the principles of Master Building focuses on integrated, multi-disciplinary design to contribute to the long-term health of a community. John’s career has included creating new residential developments and green office complexes as well as advising the White House and Department of Homeland Security on energy security and sustainability. 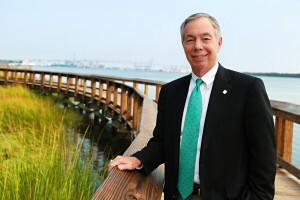 Under John’s leadership, his team oversaw the creation of the 1,400-acre sustainable development of Dewees Island in South Carolina (which won the Urban Land Institute’s Award of Excellence) and the revitalization and master planning of the once blighted historic core of the City of North Charleston (which won the American Society of Landscape Architects’ Award of Excellence). Unlike traditional developers, John’s approach focuses on identifying resources already in the community and capitalizing on these strengths to empower community improvement. His visionary partnerships at the community level have led him to be named an “Environmental Champion,” a Thought Leader,” and a “Leading Design Visionary” by industry publications.